In 2016, there were nine nationwide outbreaks of Salmonella illness linked to contact with live poultry, causing illness in 911 people in 48 states. Michigan reported 55 cases, of which almost half (45 percent) were in children. 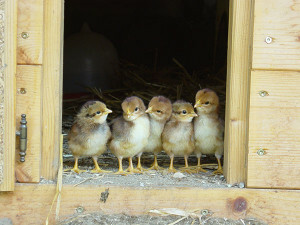 During spring, live baby poultry are often displayed in stores in a way that children may be able to reach and touch the birds or areas where the birds are contained. This is one way people become exposed to harmful bacteria that leads to illness. People may also obtain birds through the mail by placing an order directly with a hatchery that supplies baby birds to raise for food or as pets. Salmonella can cause diarrhea, vomiting, fever and/or abdominal cramps lasting four to seven days or more. Salmonella infections can be especially serious for the very young, the very old, and those with weak immune systems. Children younger than five years old, older adults or people with weak immune systems should not handle or touch chicks, ducklings or other poultry because they are more likely to become severely ill.
Wash your hands thoroughly with soap and water after touching the birds or anything in their environment. Adults should supervise hand washing for young children. Use hand sanitizer until you can wash your hands thoroughly with soap and water. Always keep poultry away from areas where food or drink is prepared, served or stored, such as kitchens or outdoor patios. Do not kiss the chicks. Do not put anything to or touch your mouth, eat or drink after handling poultry. Do not keep live poultry inside the house where people live, eat or sleep. Do not give live baby poultry as gifts to young children. Stay outdoors when cleaning any equipment associated with raising or caring for poultry, such as cages, feed, water containers and other materials. For more information, visit http://www.cdc.gov/features/salmonellababybirds/. Baby bunnies and chicks grow up to be rabbits and chickens. Before you decide live Easter pets would be a cute gift for your kids, be sure you do plenty of homework. 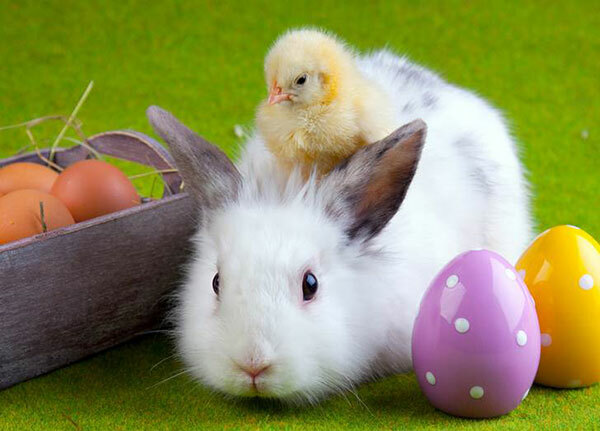 Adults should consider the life cycle, as well as health and safety issues, of giving bunnies or chicks to children for Easter. The Kent County Health Department recommends giving children toy stuffed animals instead. Every year, the Kent County Animal Shelter receives dozens of unwanted rabbits from people who can’t care for them. The shelter no longer takes in unwanted or stray chicks or chickens. Raising chicks and other poultry is popular and can be safe, but in recent years, there has been an increase in Salmonella outbreaks in humans. Salmonella is common in baby poultry and spreads from contact with the birds or their environments. Birds with Salmonella may appear healthy, but in humans, the bacteria can cause diarrhea, stomach cramping, fever, and dehydration. Illness can last for up to a week and can be serious in young children, older adults, or those with weakened immune systems. prepared, stored, or eaten. The Centers for Disease Control and Prevention has more information at http://www.cdc.gov/features/salmonellababybirds/. Rabbits can live seven to ten years. Pet rabbits have specific health needs, special diets, and must live indoors. While they can be very social with the right care and supervision, they don’t like to be held or cuddled. Releasing a house-raised rabbit into the wild leaves the animal vulnerable to predators. If giving or receiving plants for the holiday, make sure they stay out of the reach of any pets. Some items, such as lilies and daisies, can be toxic to pets. For a complete list, check out: www.aspca.org/Pet-care/poison-control/Plants. Health officials at the Michigan Departments of Agriculture and Rural Development and Community Health warn parents that the baby poultry found in feed and pet stores in the spring may carry Salmonella, a common bacterial illness found in the droppings of poultry that can cause illness in people. Children younger than five-years-of-age, older adults, or people with weak immune systems should not handle or touch chicks, ducklings, or other live poultry because they are more likely to become severely ill.
Wash your hands thoroughly with soap and water after touching live poultry or anything in the area where they live and roam. Adults should supervise hand washing for young children. Chicks should have a heat lamp and should be kept in a barn or garage, in a draft-free cage that keeps predators out. Always keep poultry away from areas where food or drink is prepared, served, or stored, such as kitchens, or outdoor patios. Do not touch your mouth, smoke, eat, or drink after handling live poultry. Clean all equipment such as cages, feed, water containers and other materials associated with raising or caring for live poultry outside the house. Spring is approaching, and many parents are shopping for Easter gifts for their little ones. Some will shop for baby bunnies and little chicks to give as gifts. There are several responsibilities that come with these animals, as they will grow into adults. Rabbits can live 7 to 10 years, while chickens can live into their teens. The Kent County Health Department encourages adults to consider the longevity, as well as health and safety issues, if giving bunnies or chicks to children for Easter. “After the Easter holiday is over, the Kent County Animal Shelter receives dozens of unwanted domesticated rabbits and several chickens,” according to Adam London, acting Health Officer for the Kent County Health Department. “Adults need to recognize that adopting or buying these cute little pets typically means a long-term commitment.” Pet rabbits have specific dietary needs and must live indoors. They can learn to be very social pets with routine handling and care. Raising chicks and other poultry has become popular, but it has also led to an increase in Salmonella outbreaks in humans. 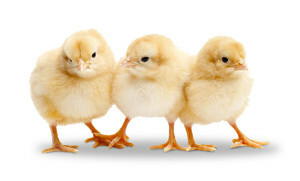 Last year, there were eight outbreaks connected to live poultry in the U.S. Salmonella is common in baby poultry, and spreads from contact with the birds or their environments. Birds with Salmonella may appear healthy, but in humans, the bacteria can cause diarrhea, stomach cramping, fever and dehydration. Illness can last for up to a week, and can be serious in young children, older adults or those with weakened immune systems. The Kent County Health Department suggests giving children toy stuffed animals this Easter. Also, if giving or receiving plants for the holiday, make sure they stay out of the reach of any pets. Some items, such as lilies, can be toxic to pets. For a list, check out: http://www.aspca.org/Pet-care/poison-control/Plants.